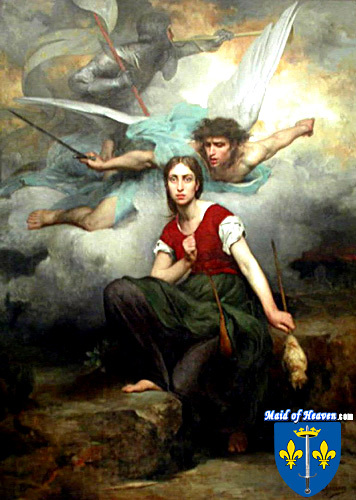 Tricky questions shouldn't have a place in a trial that is meant to be an exercise of justice but, then, Joan of Arc's trial wasn't designed to be fair. It was designed to reach the scandalous verdict of blasphemy and heresy for one who opposed English rule. At its most basic, it was the cloaking of the State in the garments of the Church so that power could be exercised in new and terrifying ways. The inquisitor--the one in charge of determining Joan's guilt--allowed her accusers to ask a leading question meant to solidify her guilt before the onlooking crowds. They asked her if she was certain that she rested within God's grace. On the surface, it seems a simple question for a woman who had received visions from God calling her to do unconventional things and speak truth to powerful and influential people. But, Joan was aware that there was no good, simple answer. If she said she knew she was in God's grace then she would be labeled a heretic for claiming knowledge that her accusers insisted was open to nobody--after all, only God could claim to know such a thing. If she said that she didn't know then she would be dangerously close to admitting her own guilt before a panel of accusers all too willing to punish her. Joan responded, "If I am not, may God put me there; and if I am, may God so keep me." Though this was a beautifully crafted response, in Joan's ears its beauty could not compare to the sound of the silence that followed it. Her accusers were dumbstruck by the careful precision offered in her words and were forced to take another route of accusation to arrive at the predetermined verdict of guilty and condemned to death. They condemned her for her visions and claimed she was an impostor wrapping herself up in the garments of the Church while serving a civil master. They condemned her for wearing men's clothing and armor as she led French soldiers to resist the abusive and land-destroying practices of the English invaders. She was ceaselessly questioned and housed in a prison guarded by English soldiers instead of in a monastery or convent as the law concerning ecclesastical trials demanded. So, when she wasn't being questioned and tricked by her accusers, she was held in a rough prison cell, forced to wear a flimsy dress that provided no protection from the cold, and "guarded" by the soldiers she had been fighting only weeks before. After she was condemned--and her condemnation caused no surprise among anybody--she was asked to sign a statement renouncing the crimes with which she had been labeled. Being illiterate, she was duped into signing the statement under threat of immediate death and then this statement was replaced with one confessing her alleged crimes. With this final duplicitous act, she was condemned to be burned at the stake for heresy without it having ever been proved or rightly tried. She agreed to wear women's clothing to her execution but this plan changed after she was sexually assaulted in her cell before the day of her martyrdom. They did not return her torn dress to her and so, instead, she was marched to her death wearing the same clothes she had worn when she fought the English who now condemned her. She was tied to a stake and burned to death on the 30th day of May in the year 1431. As she died, two clerics held a cross before her so that she might focus on the instrument of execution that had robbed her savior of his life. After the flames died down, the coals were raked back so that the crowd would have no doubt that she had died in the flames and at the hands of the English. They took the remains, burned them twice more until they were but ash and then threw the ashes into the Seine river so that no relics might be obtained by those still loyal to Joan.